Blasting Mutants into the Stratosphere! It was easy to love the retro charm of the original Blaster Master Zero when it first launched on the Nintendo Switch two years ago and it came as quite the surprise. We can all thank developer Inti Creates for definitely putting the love into any title they put out and it’s no different in there somewhat stealth released sequel Blaster Master Zero 2 from the most recent Nintendo Nindies Showcase. 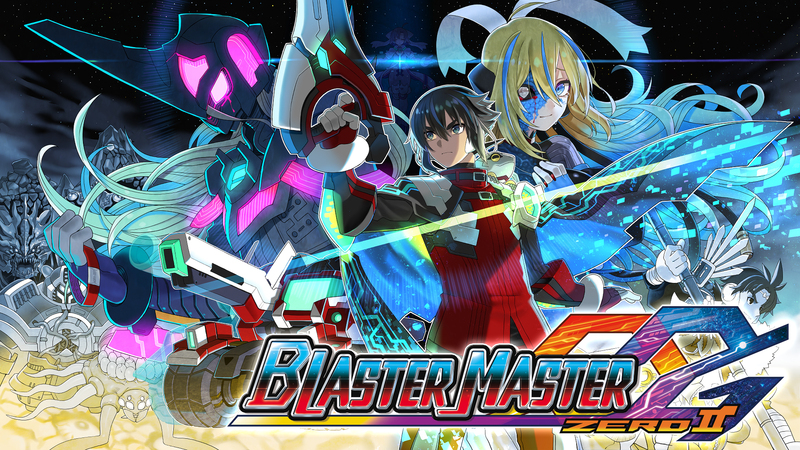 Though it definitely has some unique changes from Blaster Master Zero and is a far cry from the original NES release, Blaster Master Zero 2 is a continuation to this fun series. In order to not spoil anything from the other titles, Blaster Master Zero 2 starts off with our same main character Jason, his copilot Eve, and the battle tech SOPHIA. However, as a result of all the boss battles from the previous games, the battle tank SOPHIA has definitely seen too much action and now can only manage to support one major and one sub-weapon. Additionally, Eve herself also suffered some damage from those previous boss battles and now she’s actually suffering from some alien mutagen she acquired in the previous games, leaving our heroes to try and scour the universe to try and find a cure. Once this backstory is explained, we finally get to control our characters and even though the battle tank SOPHIA has taken too much damage over time, one major upgrade is going to dramatically change the gameplay. This change is that inertia and kinetic energy can be transformed into energy, so every time you take a major fall you’re actually charging up your batteries. But that’s not the only change in Blaster Master Zero 2, as opposed to the previous gameplay style of exploring one gigantic Metroidvania style world, the sequel has spread its gameplay across seven different areas throughout the galaxy. While each area of gameplay, linked together by a series of wormholes will definitely have one larger planet supporting most of the main story missions, smaller planetoids scattered throughout will also offer a series of challenges, as well as a ton of upgrades and maps. Even though it’s not mandatory to gather every single optional upgrade there is to offer depending on what type of gamer you are and how you engage in combat generally, some of these upgrades may be well worth seeking out. Personally, I’m probably not the greatest old-school type of player and upgrading my guns and SOPHIA on the 2D maps were great to perform, but upgrading my cannons in the 3D dungeon crawling sections was more important in order for me to survive. In case you’re not familiar with the Blaster Master Zero series, it offers two distinctly different types of gameplay. This is primarily the 2D side-scrolling arcade style where you are playing in the battle tank SOPHIA in the overworld segments, and top-down dungeon crawler gameplay that takes place as you exit your tank and start engaging with the game as the main character. However, as you get further into Blaster Master Zero 2, these two gameplay styles aren’t divided 100% of the time, but many situations in the game will actually require you to jump in and out of your battle tank. Not only in general gameplay, but also in boss fights which can sometimes take multiple forms and stages. Along with shooting guns and firing special weapons, Jason has a powerful new counter move that can freeze an enemy in place during an attack, making it easier to deal massive damage and this new technique can be used quite often which is nice. Mid-bosses on each planet, and definitely the story-line main bosses in each of the seven areas, will push you to further develop as a player and to keep progressing in order to handle all your skills and abilities effectively. As fun and novel as these boss fights are, they are not the strongest elements of Blaster Master Zero 2. While the smaller area bosses aren’t terribly difficult and still offer a fair challenge, especially certain ones that will be repeat encounters throughout your playthrough, the real issue is with the main bosses and how they have a gate-like tendency to only block you from proceeding. Skill is thrown out the window and it boils down to just having enough patience to endure their countless barrages. However, as many gamers who are fans of the classics of yesteryear know, no obstacle will be tough enough to overcome and may only be frustrating for some of the more casual players. There are plenty of health and weapon pickups dropped by enemies or hidden in objects to never truly feel like you’re constantly at a disadvantage. One thing to note is that outside of your battle tank in 2D, fall damage is a real issue and even the shortest drop can kill Jason outright. Blaster Master Zero 2 is emphatically a worthy sequel to the hit original from 2017 and continues to be a fun and enjoyable experience. Its upbeat chip tunes music is definitely well suited to its gaming environments and each of the different planets and planetoids in each of the seven different areas has its own unique feel. Enemies, areas, and environments are all unique in their own way and the intricate Metroidvania-lite gameplay with its upgrades, power-ups, and its newly implemented countering system, really is a lot of fun. If you’re the type of gamer that really does find a daunting boss boss battle type challenge to just be really fulfilling and enjoyable, Blaster Master Zero 2 is a game you definitely want to try out.